Iain Sharp is a prolific and highly-entertaining columnist, reviewer and critic and practiced performer of his poetry. Sharp is well-known for his humour and good-natured satire of the high serious of his own literary heritage, and many of his poems draw on the lyric tradition. 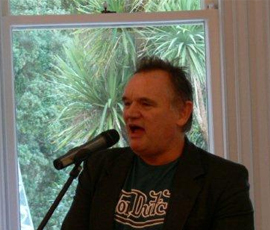 He has published several volumes of poetry and non-fiction, including Real Gold: treasures of Auckland City Libraries (where he is a specialist librarian).